Our website has changed! 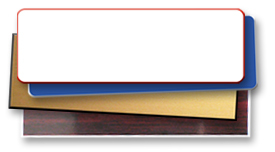 We have now made it easier to order a predefined stock template name tag. Select a template and material type from one of our available options. Each option has been set up with predefined text lines and a name tag size. 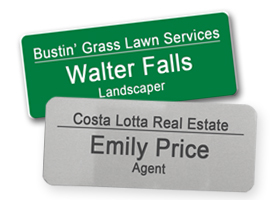 No proof is required for these name tags, and there is no required set-up fee. Provide your name and title list when placing your order for possible next day shipping. Keep in mind that quantity, material and other options selected on the order page will affect the pricing and production time. All text is laser engraved into the top layer or core of the plastic to reveal the second color to create a two color plastic name tag. Solid colors have a matte finish, metallic colors have either a brushed or smooth finish, and wood grains have a slight gloss finish. 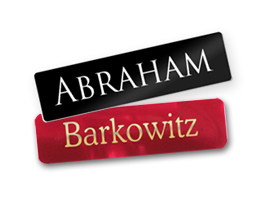 Laser engraving creates a two color name tag. Each colored metal has a lacquer finish or a reflective mirror-like finish. The engraved color will be the silver or bronze of the underlying metal. 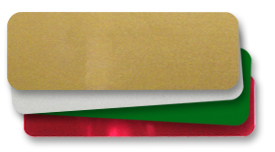 On gold and silver tags the laser oxidizes to a dark gray or black. All of these predefined templates have the option of adding at least a first name. As you browse these templates, notice that each option has different features. Such as Styles A and B only have one line for a first name, while styles J and M both have three lines for names, titles and company name. Each template option comes in plastic or metal and has the same color choices! Choose from 29 plastic color combinations and 18 metal colors. Plastic options come in a combination as the engraving process requires that one color will show through the other. Metal is a bit different as it just reveals the underlying color of the metal instead of a two layer plastic. 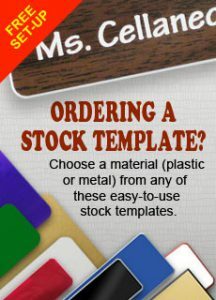 Whatever your choice, these new stock template pages are easy-to-use and will give you a professional looking name tag. And, they’re sure to meet any need!